Last year, we were invited to the launch of Starbucks Teavana. This year, they celebrated their first anniversary in Asia with the launch of 2 new drinks which were better than last year much to my surprise. 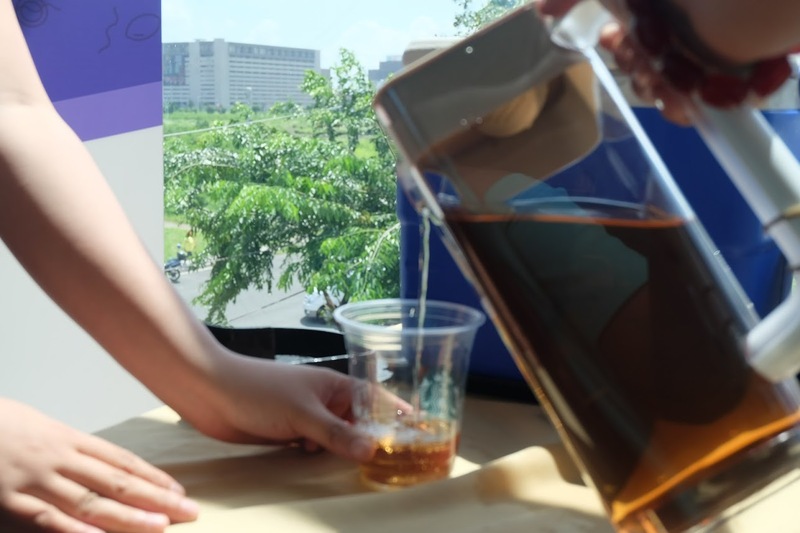 Initially, I was hesitant because this is tea we are talking about but apparently, there are many things you can do with tea and one of them is to make it Frozen Tea. 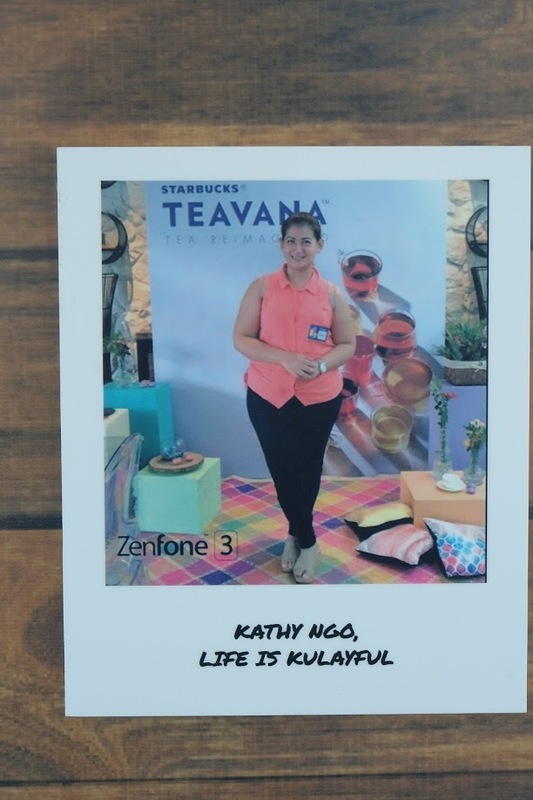 Here's a photo of me on the Starbucks wall from last year's event. I have to admit that I felt a bit giddy when D pointed it out to me. Of course he had to make fun of it a little bit because just about a week ago, I wore the exact same outfit right down to the shoes. Hahahaha. 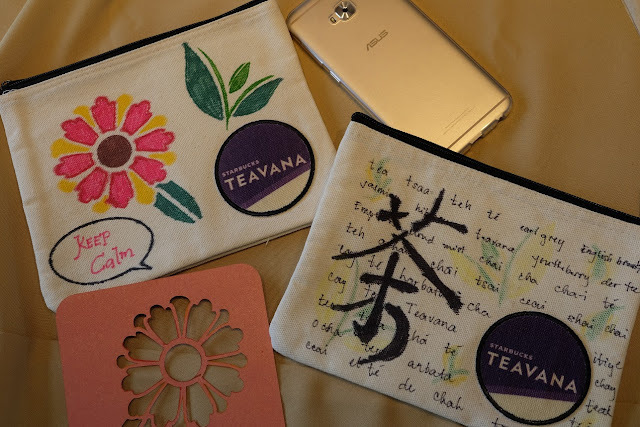 We were initially asked to personalize a couple of Teavana pouches and we all had fun doing it. Patty of The Lifestyle Wanderer and I had fun though we did not win because there were just too many talented hoomans at the event. 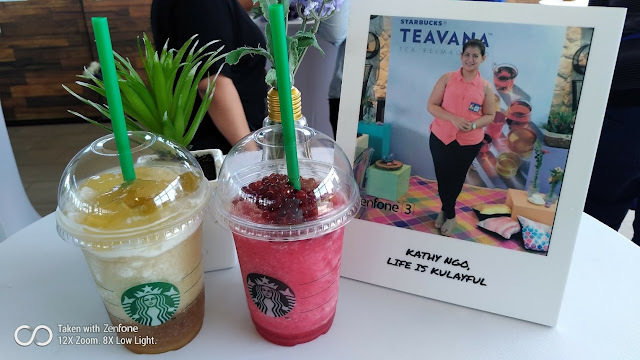 Finally, they unveiled their latest drink which was the Teavana Frozen Hibiscus Tea with Pomegranate Pearls and the Teavana Frozen Chamomile Tea with Kyoho Grape and Aloe. Personally, I loved the Frozen Chamomile. The Kyoho Grape and aloe made it super refereshing. The Frozen Hibiscus Tea with Pomegranate Pearls combines floral notes of hibiscus flowers and rose petals with the tropical flavors of papaya and mango. You actually won't even feel that you are drinking tea because it is also enhanced with hints of cinnamon and lemongrass. Topped with glistening, jewel-like pearls of pomegranate juice that bursts on the tongue is the perfect way to end this drink because it will make you giddy. 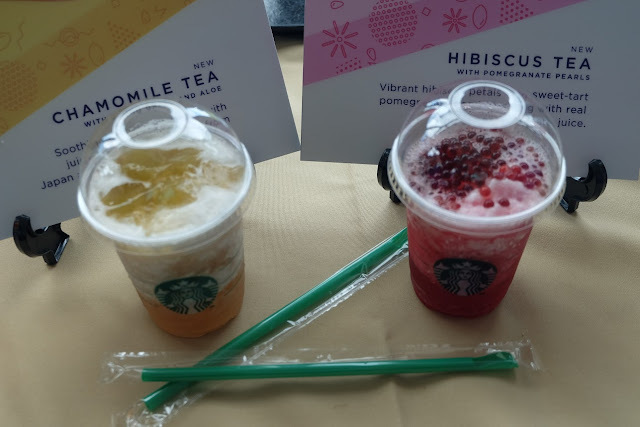 The Starbucks Teavana Frozen Chamomile Tea with Kyoho Grape and Aloe on the other hand is more soothing and relaxing. This is blended with honeyed white grapes and aloe cubes delivering a cool, lightly sweet taste which I really love. As everyone knows, I love anything sweet so I was naturally drawn to this drink. Also, this beverage is generously topped with skinned and pitted whole Kyoho grapes which happens to be a popular variety of grapes from Japan that is famous for it's distinctive sweetness and generous size. Now, one of the best parts of the event was being given the chance to play barista and make our very own Starbuck Frozen Teavana. Of course I chose the chamomile version because it's become my favorite already. Thankfully, P took photos while D photobombed, I mean, took videos. 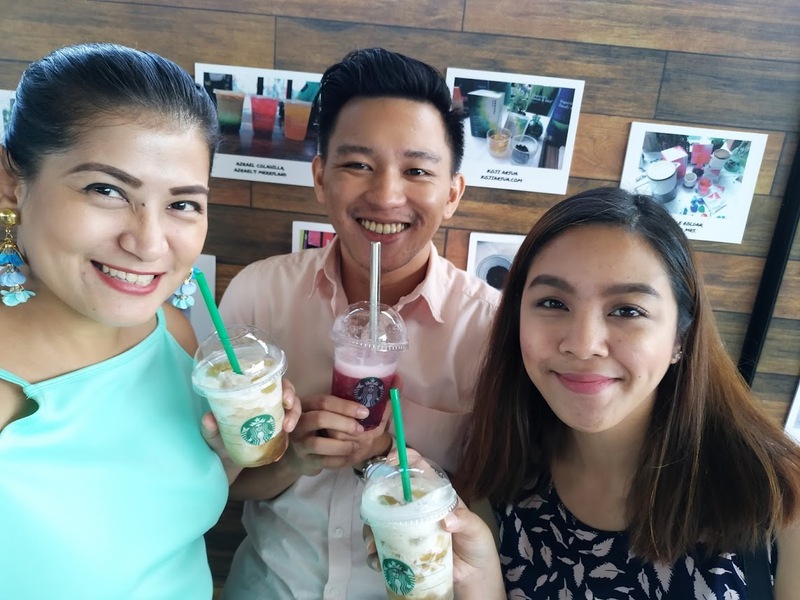 I learned a lot from Gail, the barista who helped me out, and had fun making my drink. I never knew that there was a lot going on in making one drink. I now have better appreciation of the barista's and their job. This is available starting September 12 until November 1, 2017. Yes, it is only for a limited time so it is most likely that I will be drinking this at least once a week for the few weeks that it will be there. I hope Starbucks changes their mind and make this a permanent part of their beverage menu because it is just so good. Good news to Starbucks Card holder though. 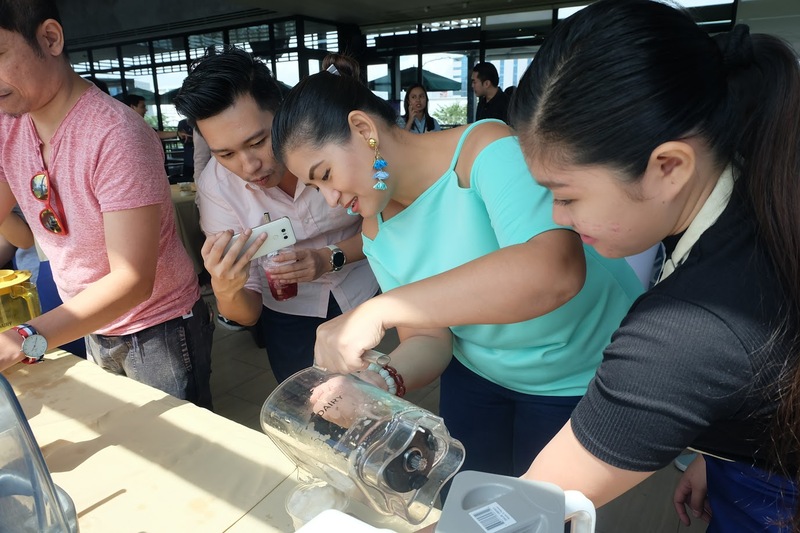 So long as you use your cards to purchase your beverage, you get to try out these drinks ahead of those who do not have a card. Starting September 9, you can already order these and trust me when I say that you really should. P, D, and I all did. 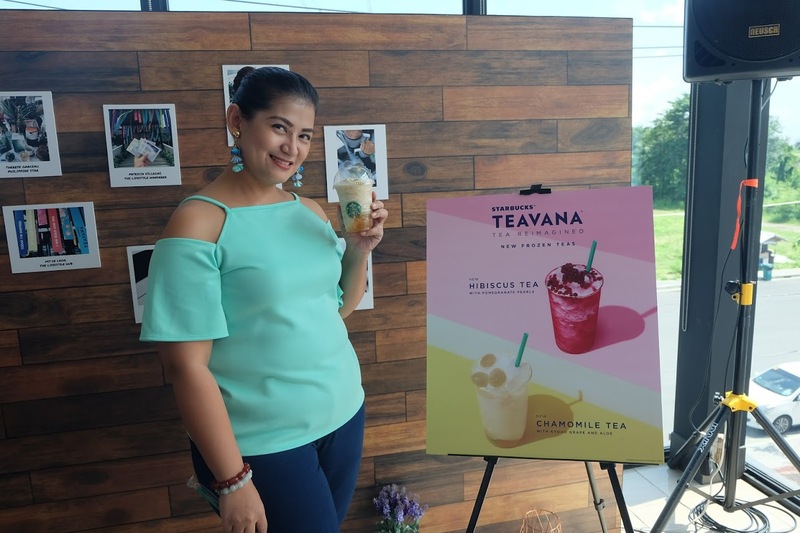 For people who are not a fan of coffee, this is a great option that they will definitely love. For more information, you can also visit here.